Athenian Potters and Painters III presents a rich mass of new material on Greek vases, including finds from excavations at the Kerameikos in Athens and Despotiko in the Cyclades. Some contributions focus on painters or workshops – Paseas, the Robinson Group, and the structure of the figured pottery industry in Athens; others on vase forms – plates, phialai, cups, and the change in shapes at the end of the sixth century BC. Context, trade, kalos inscriptions, reception, the fabrication of inscribed painters’ names to create a fictitious biography, and the reconstruction of the contents of an Etruscan tomb are also explored. The iconography and iconology of various types of figured scenes on Attic pottery serve as the subject of a wide range of papers – chariots, dogs, baskets, heads, departures, an Amazonomachy, Menelaus and Helen, red-figure komasts, symposia, and scenes of pursuit. Among the special vases presented are a black spotlight stamnos and a column krater by the Suessula Painter. 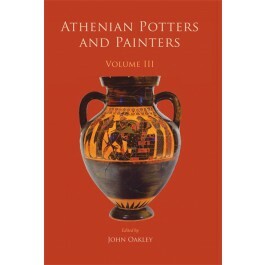 Athenian Potters and Painters III, the proceedings of an international conference held at the College of William and Mary in Virginia in 2012, will, like the previous two volumes, become a standard reference work in the study of Greek pottery. "“A substantial volume, physically and in content, with excellent illustrations and colour plates.” "
"There is much valuable observation here…"